I’ve never written about cruises before, and for a very good reason: I know almost nothing about the topic! Granted, I have been on a few boat trips in my life, from a three-day sailing trip among the San Blas Islands in Panama, to a 10-day voyage along the Antarctic Peninsula on a small expeditionary cruise ship. However, when people talk about cruises, they mean something entirely different: massive hotel-like ships, ports of call, large buffets, swimming pools, and so on. Fortunately, I do know someone who is quite the expert on cruising. 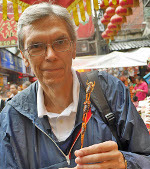 Fellow blogger and ex-journalist Paul Marshman, author of the excellent blog The Travelling Boomer, has enjoyed many cruises, including some where he travelled solo. When I suggested an interview, Paul graciously agreed to help educate me and my readers about this popular topic. Our conversation follows (with my inner thoughts in italics). All photos, except the last one, are courtesy of Paul Marshman, The Travelling Boomer. Big Travel Nut: You’ve written a lot about your love for cruising. What is it you like about it? Paul Marshman: What I really like about cruising is that it’s a moving feast. You buy one ticket and you get a whole list of places delivered to your front doorstep, without dragging your suitcase through a dozen airports. Every morning you wake up and you’re in another cool place. As I like to say, it’s like staying in a nice hotel that does the travelling for you. That said, I also just like being on the ships. I didn’t know if I’d like cruising, but I found myself captivated by the ships themselves. The nautical touches, the different restaurants and theatres, the experience of watching the sea go by, seeing whales … it’s all cool. BTN: Is there anything you don’t like about cruises? PM: There are a few things. The first is the length of the port visits: mostly you get just one day, which is really only enough to get a taste of the place. A lot of people think of a cruise as a sampler for places they might want to return to. 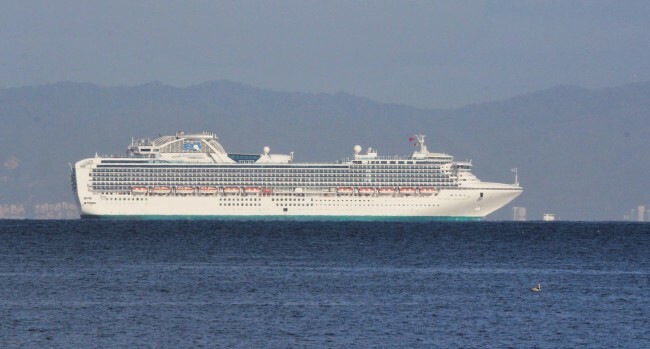 Nowadays, however, some cruises spend two days in major ports. That’s an improvement. Then there’s the constant selling: everything from excursions, to cocktails, to courses, to paintings and photos of yourself. On some cruises this can be pretty annoying, although it varies between cruise lines. I found Princess to be bad for that. Still, that’s more of an annoyance than a deal-breaker. If you watch TV, you’re pretty used to being sold things all day long. Third, as a solo cruiser, I come up against the single supplement, which can be as much as 100% on some cruises. You can end up paying double for the privilege of sailing by yourself. BTN: North Americans are familiar with Caribbean cruises, but what other options are there? PM: There’s a whole world of cruises out there – almost literally. You can cruise pretty much every sea and ocean in the world, as well as a lot of the rivers. In the new world, you can cruise to Alaska and see icebergs and whales, or sail right around South America – even down to the Antarctic. On the other side of the world, there are South Pacific cruises, with visits to Australia, New Zealand and Polynesia. Then there’s Europe: you can cruise the Mediterranean, with its ancient cultures, and the Baltic Sea, to experience the midnight sun. The British Isles, the Norwegian fjords … there’s a lot of possibilities. 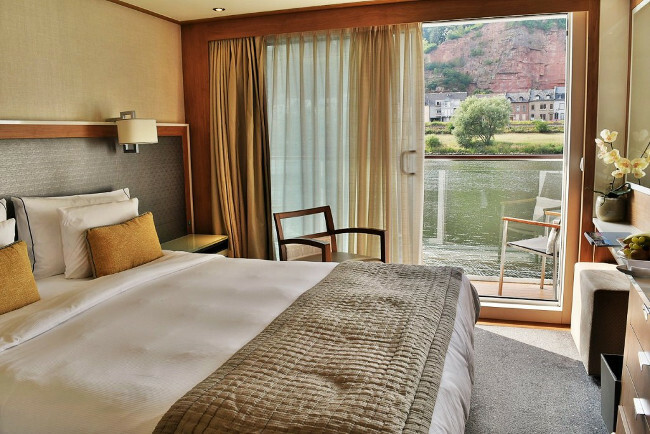 Then there are the river cruises, which are getting more and more popular: I just returned from an enjoyable Viking cruise down the Moselle, Rhine and Main Rivers. There are also cruises for special interest groups, like Rock & Blues cruises, adventure cruises, and gay cruises. And if you have an extra $30,000 to spend, there are round-the-world cruises that circle the globe for six months or so. 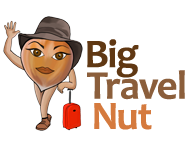 BTN: Tell us briefly which cruises you’ve been on. PM: My first cruise was a writing assignment for a magazine. It was a Disney cruise – the last thing I would have chosen. But I thought, “What the heck, let’s go and see what it’s like.” And despite the hordes of little munchkins running around, it was an enjoyable experience. Later, I got an assignment on a Holland America cruise to the southern Caribbean, going to places like Aruba and Curaçao. I also got a cruise assignment on a recreated sailing ship, run by a Canadian company that’s now defunct. It went to the French Caribbean, and it was a great experience. On those cruises I was generally part of a group of journalists, but I didn’t know whether I had the nerve to cruise solo. Then I got an e-mail offering an affordable cruise around South America and the Antarctic Peninsula, and I was hooked. I had a great time, and saw some amazing sights. That was a Princess cruise, and later I cruised solo to the Baltic and the Mediterranean on Norwegian Cruise Line. Most recently, I got a river cruise from Viking as a press trip for The Travelling Boomer. You can see my full review here. BTN: What has been your favourite cruise so far? PM: That would have to be the Antarctic cruise. Even though I was on a big ship and we didn’t get to go ashore, it was a trip of a lifetime. To see those huge tabular icebergs looming up on the horizon, and seals and penguins swimming alongside the ship, was an amazing experience. I’m a birder, so I also loved watching the albatrosses and petrels as they flew by. We did make stops in places like Ushuaia and the Falklands, too, so I got to see wildlife close up. BTN: Has anything crazy happened on any of your cruises? PM: Yes, one of the classic traveller’s nightmares. On my Caribbean sailing-ship cruise, the airline lost my luggage – for the whole week. I only had an hour or two before the ship sailed, so I ran down to the tourist market at the dock and bought a couple of things, and off we went. I got through the entire cruise with only a couple of t-shirts and a pair of shorts. A crew member loaned me some socks and underwear. But then, it was 30 degrees Celsius every day. What else do you need? 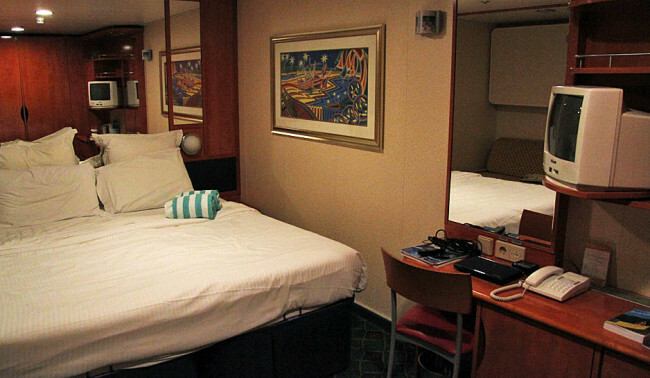 BTN: Do you have a favourite cruise company, and if so, what’s so great about it? PM: My favourite line these days is Norwegian Cruise Line. I like their ships, and I like their “freestyle” dining policy: you just show up when you’re ready and they seat you, like a restaurant. They even ask if you’d like to share a table, which is a great way to meet people. It’s the first line that’s made me feel comfortable dining solo in the dining rooms. As well, I don’t find the onboard sales pitch as pushy as on some other lines. Norwegian’s newest vessels are mega-ships with a lot of great innovations, like live shows in the dining venues and their famous studio cabins for solo cruisers, which come with free access to a special lounge. I’d like to try one of those. BTN: So there are some cruise lines that cater to solo cruisers. But how do you beat the dreaded single supplement? PM: That’s a tough one, but there are some strategies you can use. First, watch for cruises that have comparatively low single supplements. 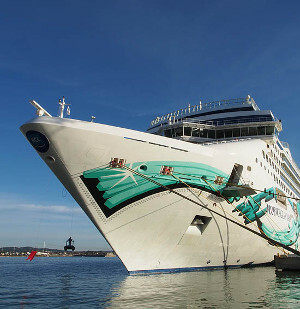 In some cases, cruise lines will give you a break if they’re trying to fill their cabins. But the best strategy I’ve found is just to shop smart. Especially during the “wave season” (typically January to March), the cruise lines offer good cruises at exceptional prices. And if the deal is good enough, you can get a great price even with the single supplement. For example, my 11-day Baltic cruise cost me only about $1,200, plus about $130 for gratuities – not much over $100 a day. Of course, the price you pay depends on the cabin you choose. I’m content to save money by booking an inside cabin, but if you need a view, you’ll pay more. BTN: Who can you expect your travelling companions to be on a cruise ship? PM: Different cruises attract different cruisers. 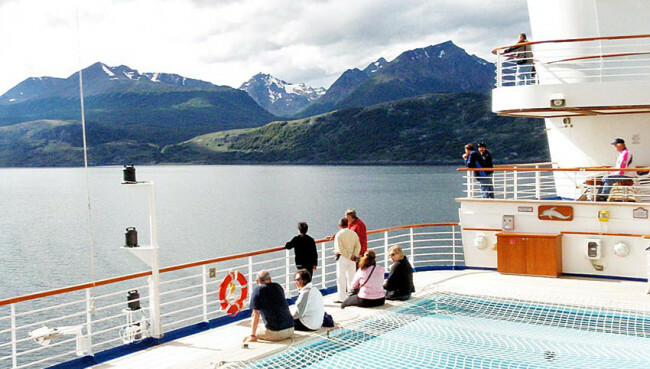 On cruises in the Americas, you’ll mostly find average North Americans – middle-income couples, singles and families. 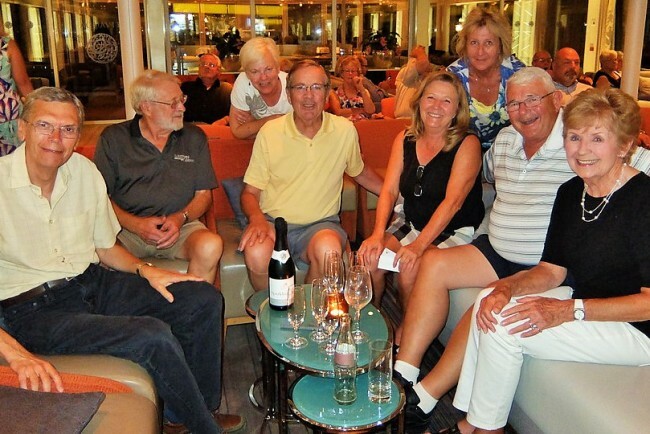 If you cruise in Europe, you may find yourself among a very international group, which gives you a chance to meet people from a lot of other countries. I’ve spent an enjoyable time with people from the U.S., England, Germany, Sweden and New Zealand. Cruisers tend to be an older crowd. On my Holland America cruise, I was one of the few men on board whose hair wasn’t completely grey. But lines like Carnival Cruises have a younger crowd, and there are even “party cruises” with a frat house vibe. Generally speaking, the longer and more expensive the cruise, the older the crowd tends to be. And more adventurous cruises, like my Antarctic voyage, attract younger travellers. BTN: How does the cost of a one-week cruise compare to a one-week land-based trip? PM: That’s a hard calculation. Certainly, cruising is more expensive than just flying to a resort and staying there. But then, a cruise typically goes to at least three or four different places, and includes a nice (but small) room with a dedicated cabin steward and a lot of free entertainment. So you have to compare the cost of a cruise with a trip that goes to the same number of places, and includes all the related expenses. On my site I did a breakdown of a cruise versus a parallel land trip, and surprisingly, I found the costs pretty comparable. However, that was using regular cruise prices: if you look for bargain prices the way I do, cruising can be a lot cheaper than regular travel. And then there’s the convenience, which is especially big for older travellers like me: you unpack once and you’re good for the whole cruise. And every night there’s a nice, free meal waiting for you when you get home. BTN: Do you have any tips to help newbies decide what cruise they should take? PM: If you’ve never cruised, it’s not a bad idea to start with a short cruise, just to see if you like it. Some people just don’t like being on a ship with a couple of thousand other cruisers. After that, I’d say look for a cruise that goes to places you really want to see. Then do a web search (see below) for info on the ship and reviews of past cruises from previous passengers. If you’re going to ports that interest you and the cruise is reasonably well organized, you’ll likely have a good time no matter what. BTN: How do you start shopping for a cruise? Are there any websites that offer cruise deals? PM: There are a lot of websites that offer the latest deals from all the cruise lines. I use Cruise Critic (the bible for all things cruise-related) and Crucon, but there are many others. They’ll e-mail you the latest offers if you sign up. There’s even a site called Cruise Compete that lets travel agencies send you bids on the cruise you choose. I’ve compiled this list of cruising resources on The Travelling Boomer. The cruise lines will send you their best deals if you sign up (or if you’ve cruised on their ships), so you can always book directly with them. However, it’s always worth checking with the big cruise retailers first: they can offer extra perks, like a cabin upgrade or a shipboard credit you can use for things like drinks and laundry. For solo cruisers, the Solo Traveler website has info on tours and cruises with no single supplement, but they’re usually small, boutique cruise lines with fairly high prices. BTN: Sounds like you’re a true cruise convert. Where are you cruising to next? PM: I just checked off one of the items on my bucket list with my European river cruise. But I still need to see the Galapagos, although that’s not really a conventional cruise. And I’d like to do the Greek Islands on a small boat, as well as the Adriatic – the ports are supposed to be beautiful. And if I reach 90 and only have a few months left, maybe I’ll spend it going around the world on a grand voyage. That would be a pretty good farewell tour. Santa Fe Island, Galapagos. Paul’s next cruise destination? BTN: Wow, thank you so much Paul. That’s a lot of good information to reflect on and get us started. Since cruises appeal to mainstream travellers (unlike my usual jaunts into countries like Colombia and Cambodia) I may even be able to convince a friend of sharing a cabin with me, thus avoiding the single supplements all together! Have fun on your future cruises Paul. 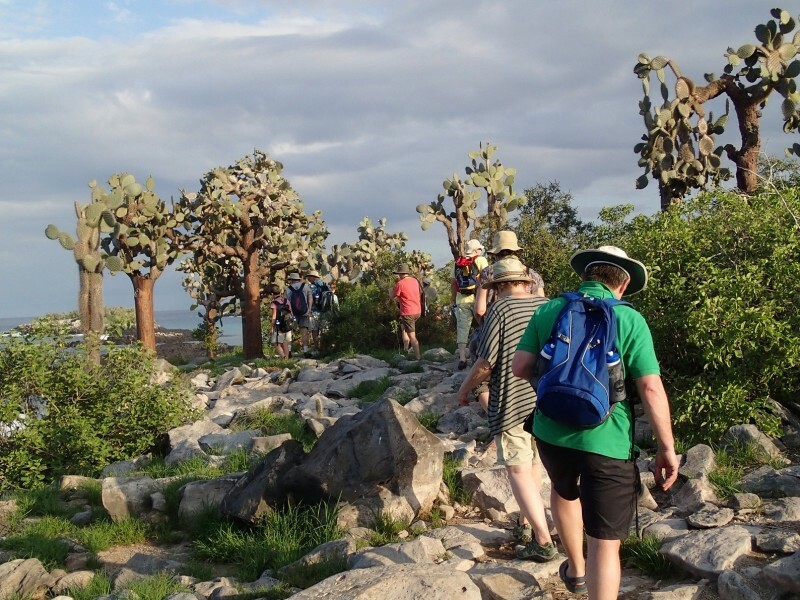 It’s hard to go wrong with places like the Galapagos, the Adriatic and the Greek Islands! Hey Marie, this was a great interview! I enjoyed reading it. You asked lots of really different questions, and got a lot of information. Good read! I should say that we’re not really attracted to the 1000+ people cruise (although Antartica DOES sound enticing – just worried about the seasickness!). 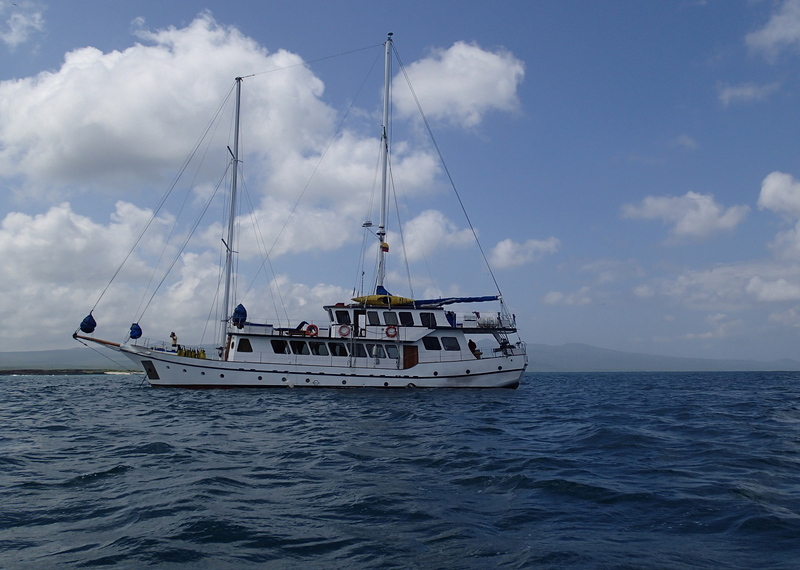 However, we have been on “cruises” in Fiji, the Galapagos, and just recently in Komodo National Park in Indonesia, all with less than 20 passengers on the boat. THAT is very pleasant, personal service, it really feels like a home (you go anywhere in the boat – except crews’ quarters), and get to know everyone. Thanks Claudia. I’ve been on small boats as well and I do like them except for the fact that the cabins are closets and there is a real danger of seasickness. I’ve never been on a big cruise ship so I was curious to hear more about the concept. River cruises also sound interesting, and are becoming very popular. G Adventures is adding river cruises to its roster (small groups of 16 to 48 passengers) to places like the Amazon, the Mekong, the Ganges, and the rivers of the Burgundy region in France! For single cruises, also check out http://singlescruise.com and http://www.cstn.org/news/cruisecalendar.htm.